Hello Readers Mine! We're almost through the thirty day push to get the episode guides for Seasons 1 - 5A to the folks at ECW Press, and that means I've been spending a good deal of time rewatching, so I thought I'd share my thoughts on one of Season 5A's most memorable episodes. Hope you enjoy! 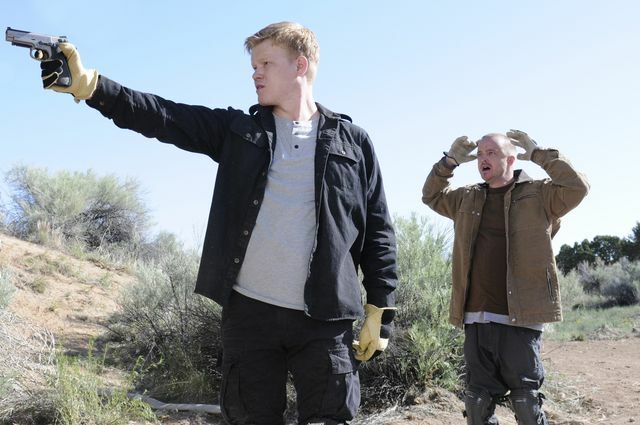 Todd (Jesse Plemons) and Jesse (Aaron Paul) in "Dead Freight" (5.04). Season 5 has seen Breaking Bad return to a focus on family, and widen the lens to include several different kinds of family. Walt still insists that everything he has done over the past four seasons has all be for his own family, while Hank and Marie are discovering that they enjoy being parents, and are working hard to help Skyler and Walt sort things out. Skyler, on the other hand, has no intention of working things out with Walt, but is willing to do anything to protect her children. However, Gilligan & Co. have quietly developed several other families which now at least in part guide the actions of the central characters. Mike only agrees to go into business with Walt in order to keep his men in prison quiet by getting the money they need to take care of their families. Mike himself is putting all of his “hazard pay” into a massive trust fund for his much loved granddaughter Kaylee. Jesse continues to support Andrea and Brock even after he and Andrea have split up, because they’ve become his “instant family.” Finally, and perhaps most unexpectedly, Lydia continues to reveal a truly fierce loyalty and love for her daughter, becoming most distraught when contemplating her little girl being left alone in the world. The ties binding these people together are intricate and dangerous, and go to show that, in Breaking Bad, there are no free agents, no one who can go down without hurting “innocents.” In fact, everything the central characters do winds up hurting someone, somewhere. Despite a daring train robbery presented with all of the skill and suspenseful drama of The Italian Job or The Thomas Crown Affair, at the heart of “Dead Freight” is the truth that, no matter how good they are, no matter how pure their intentions, no matter how much control they are able to exercise, what Walt, Jesse, and Mike do kills people, and there is no avoiding it. The boy on the dirt-bike is a classic example, and his brief arc is carefully crafted down to the smallest details. Sound is vital in this episode. The roar of the kid’s bike blocks out everything else, particularly through his protective helmet. It is only because he saw and stopped to capture a tarantula that he dismounts, takes off his helmet, and lets his bike idle at a much quieter rate. This in turn stops him just long enough and makes things just quiet enough, that he hears the train-whistle in the distance. The careful attention to sound effects in the cold open is mirrored in the final scene of the episode, where, the theft of 1000 gallons of methylamine successfully completed, Walt, Jesse, and Todd hoot, holler, and celebrate before turning off the motor to the water-pump only to hear a softer but similar sound in the idling of the kid’s bike. What follows is a brilliant use of what TV scholars call intertextuality, when an actor well known for a particular role carries the audience’s memory of that role over into a new one. Here Jesse Plemons, best known for his role as Landry Clarke on Friday Night Lights, a lovable, loyal, truly good young man, is seen to gun down a young kid. Though the viewer is well aware that Plemons is playing a different character in Todd, seeing an actor associated so strongly with a good guy do something so unforgivable heinous makes the murder of the boy even more shocking. Within the narrative, this is Jesse’s worst nightmare come true, for it was he who told Todd that absolutely no one could ever know about the robbery, which Todd understandably interpreted as instructions to ensure that no one would ever know. Like Gus Fring telling his street-dealers “No more children” in “Half Measures” (3.12), Jesse’s unthinking words have led directly to the death of a child. Jesse is suddenly much further on the road to becoming that which he hates, and thus to breaking bad completely. Hello, Readers Mine! I hope this Meth Monday finds all of you hale and hearty and not, you know, strung out on crystal meth or desperately hoping your brother-in-law the cop doesn't figure out what your other job is. By the way, all of the clips below are the property of AMC and Sony Pictures, but I found them either on YouTube or Vimeo, so no copyright infringement is intended. "Fly" is perhaps Walt's last chance to redeem himself, a pivotal moment where he can choose to turn around and walk back into the light, or continue to move deeper into the darkness. Walt chooses the darkness, and the cold open of "Gliding Over All" sees him remembering that long night in the now destroyed Superlab, only now it is truly too late. Gus is dead, and Gale, and Mike's body is actually in his trunk waiting to be dissolved, his relationship with Jesse seems to be over, and his marriage and family are all but an illusion. There is no turning back now, and all the flies in the world aren't enough to rouse Walt's conscience. If you watch carefully, you will see every iconic angle and shot associated with Breaking Bad appear at some point in the montage: POVs, up-and-through, exterior time-lapse, accelerated motion, transitioning by moving behind and out from objects in the foreground, forced perspectives, jump cuts, low angles, high angles, close-ups, shot to shot transitions, etc, etc. The entire sequence is a love song to the tremendous cinematography used from the very beginning of the series, and is beautifully done. I hope you enjoyed the time for thoughtful reflection on 4.5 seasons of groundbreaking, incredible television and a storyline more intricate and thoughtful than almost any other, because staring in July, Readers Mine, everything changes. Breaking Bad can be seen as a kind of modern day voyage into the heart of darkness. Over the course of five and a half seasons, Walter White has progressively made choices, usually quite consciously, that have led him to abandon the moral and ethical strictures which govern civilized behavior, and each choice has successively eroded a bit more of his conscience. In other words, Breaking Bad is a dark show. As viewers and human beings, however, we can't take too much unrelieved grimness without changing the channel or going insane, so even the Icelandic Sagas have jokes in them, and Willie the Shake was far from being the first scribbler to throw in a wise-cracking gravedigger or two to lighten things up a bit. Like all great dramas, Breaking Bad uses comedic relief to break the tension and give us the chance to laugh out the darkness a bit, and nowhere, Readers Mine, do Gilligan and Co. do this more wonderfully than they do with "Buyout" (5.06) and The Most Uncomfortably Hilarious Dinner in TV History. Jesse (Aaron Paul) endures dinner with the Whites in "Buyout" (5.06). In Season 5.1, Walt and Skyler are waging a very cold war. In the midst of this conflict, Jesse and Mike are trying to convince Walt to sell out for a cool $5 million and get out of the meth business, but Walt is having none of it. As another move in the war with Skyler, and to demonstrate why he's so determined to keep making meth, Walt invites Jesse to have dinner with them, though Jesse desperately wants to leave. Walt follows is an extended scene of such extreme social discomfort that it is literally laugh out loud funny. Walt and Skyler sit at opposite ends of the table, staring at each other as they rapidly drink down their wine and liquor supply. In between the two of them sits Jesse, drinking a tall glass of ice-water and trying desperately to break the tension with small talk. 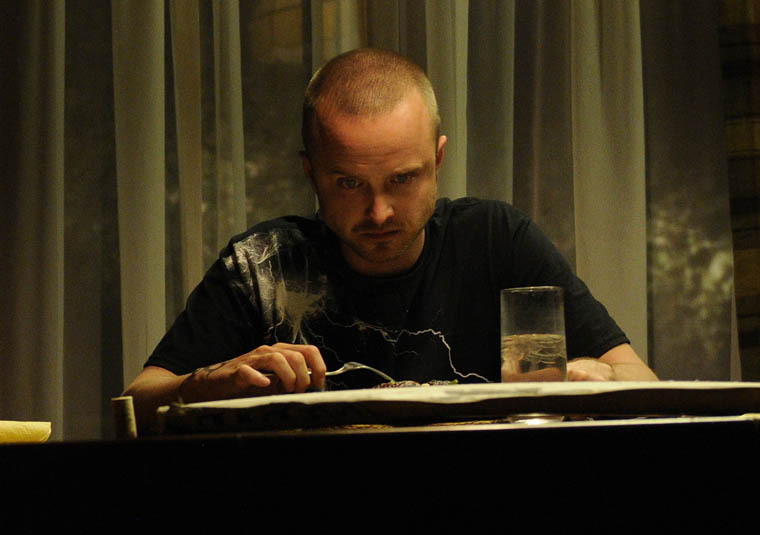 Aaron Paul's eyes, which dart back and forth, and his long drinks of water as he tries to hide behind his glass, are as perfectly timed as his attempts to engage Skyler in conversation on everything from green beans to frozen dinners to the car wash. Sitting across from Junior's usual spot, Jesse is in the symbolic position of a kid trying to pour oil on the waters between parents who are viciously arguing with each other via the old Silent Treatment. Sky brings the dinner to an end by asking Walt if he's also told Jesse about her affair and then stalking off with her wine bottle. Jesse can't even look at Walt and feigns an intense interest in the wall behind Skyler's vacated chair. Walt: "You know my kids are gone?" As Walt reveals an increasingly callous attitude to human life, even that of a child, and as he becomes fully determined to become every bit the monster Gus Fring was, all in the service of proving that he is somebody, no matter the cost, this brilliantly comic dinner scene throws a dash of humanity and much needed humor into the mix, enabling the viewer to rest, for just a moment, before encountering the next bend in Walt's darkness. That's it for this week, Readers Mine. 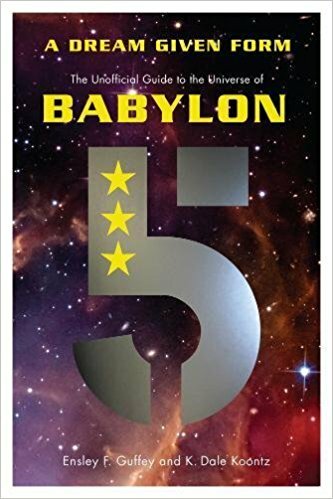 Short and sweet, I know, but Dale and I are on a thirty-day push to get the draft of Seasons 1 - 5.1 plus extras into ECW Press for copy-editing by 1 April, so most of today was spent with line edits and annotating Season 5.1. Don't forget to check out Dale's "Walter White Wednesday" this week, and be sure to follow me on Facebook and Twitter for all of the latest Breaking Bad news, as well as a healthy serving of whatever the hell crosses my mind during the day! Our Army at War #207, Featuring Sgt. Rock! Since I went to grad school, I've had the great good fortune to spend a fair amount of time in a town with a really good comic book shop in it. Atomik Comiks in Johnson City, Tennessee has become a weekly tradition as I drop in to pick up whatever comics have come in, and (perhaps even more importantly) to hang out for an hour or three and shoot the breeze with owners Shawn Samier and Lynsey Holliman, and whoever else might pop in in the interim. It's really one of the best comic shops I've ever seen, and Shawn's collection of Silver Age (roughly 1956 - 1970) comics is just phenomenal. If you're both into comics and in the area, you should check it out. Anyway, yes I still buy comic books and rather than go into some sort of unnecessary defense of the practice I will simply quote from a 2005 interview with Joss Whedon where he was asked if he still read comics. Whedon replied, "Yes, at age forty-one I go into a comic book shop every Wednesday." It would thus appear that I am in good company. (For the unwashed out there, Wednesday is New Comic Day.) So, over the past few months I've become more and more interested in the work of Joe Kubert. I've always been a fan, even as a child when I wasn't really aware of who was scripting and drawing the comics I liked, but I knew what I liked. Nowadays, however, I have some experience and education in both American popular culture studies and US history, as well as an adult awareness of the creators behind the cool stories and art. An artist like Kubert, who's career began in 1942 and ended only with his death in 2012, and who's own interest in history was not exactly negligible, is like a load stone for a guy like me who's primary academic interests are war, American memory, and American myth. 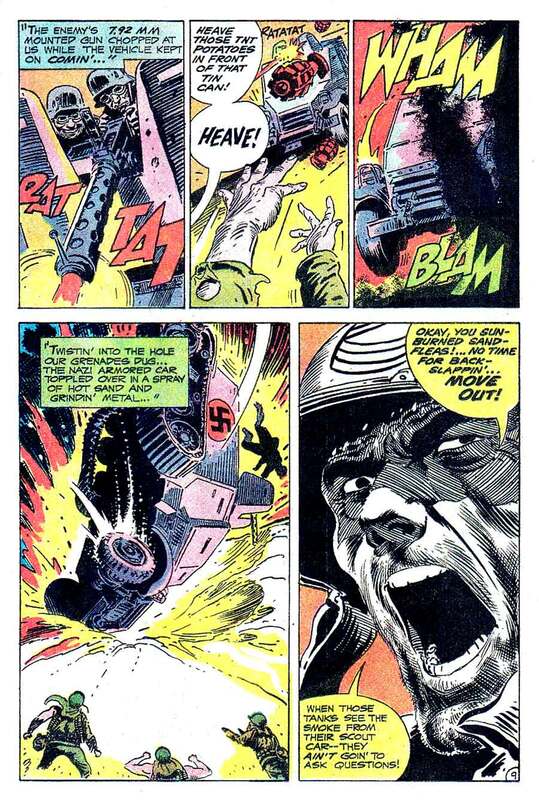 Kubert's strong lines, mastery of shading, and fearlessness of blacks is clearly on display here, as is his dedication to a level of realism that even in 1969 when the comic was printed, remained unusual. The GI's aren't clean cut with immaculate uniforms, or calm and cool in the face of danger, and the tanks approaching them are quite readily identifiable as Panzerkampfwagen VI Tiger Ausf.Es or "Tiger I"s. Now I'm not saying that Kanigher and Kubert were dedicated to true realism, because Rock and the "Combat-Happy Joes of Easy Co." got out of more scrapes and scraps than any actual World War II US Army infantry company could have, but within the constraints of the comic book world, when you read their Sgt. Rock, you're getting more grit and grime and PTSD than is the usual for such fare. Our Army at War #207, p.9. Script by Robert Kanigher, art by Joe Kubert. What you need to notice is what's not in these panels. Look at the whites, where no color has been used, particularly on Rock's face in the final panel. Against the light orange background which perfectly evokes both the heat of the North African desert and flames from the destroyed German scout-car, Kubert's brilliant pen and ink work on the shouting Sgt. 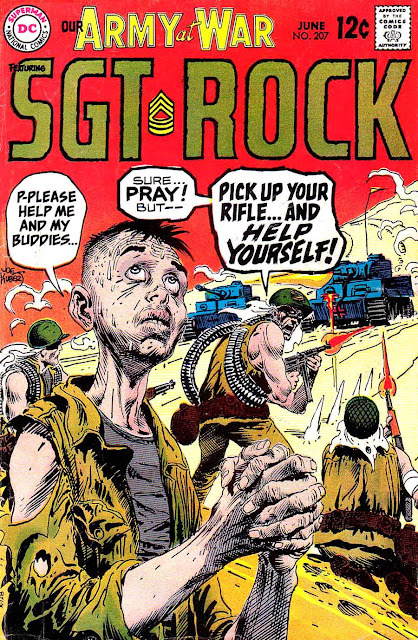 Rock's face, left in "simple" black and white makes the image jump, and underlines and emphasizes Rock's shouted command driven by a hard-earned knowledge and fear of the war. I haven't seen a single panel in any of the modern books I have collected to match this one. Despite all of the CG rendering and coloring, and the undeniably gifted artists and writers that currently make up the modern comics market, they just can't match this. You can't call Kubert's work on Rock's face here an instance of less-is-more (indeed this may be the single most detailed image in the entire comic), but what's going on here is a far greater understanding of how art works, particularly how sequential art works, than is usually found today. The high-detail black and white image against a colored background and with colored word-balloons was a clear choice to shift the emphasis of the story from combat, explosions, and derring do, to a far more intimate focus on Rock and the knowledge that a single act of destruction is not victory but an invitation for further deadly violence against the all too fragile men of Easy Co. It is - simply - brilliant. And beautiful. Our Army at War #207 gave me the kind of comic book reading experience that I remember from my childhood and teenage years and which contemporary comic books, particularly from Marvel and DC, all too often lack. It is a painstaking attention to detail and artistry that can make a simple story (which this Sgt. Rock piece assuredly is) into something truly great, and which demonstrates why comic books can be works of art, and are worth intense critical study as an art form. Keep in mind that O.A.A.W. wasn't a prestige title. For all of it's popularity and sales for DC, it wasn't Batman, Superman, The Flash, or The Justice League of America. It's just that Kanigher and Kubert (by this time Kubert was also editing the series) cared about their product and their art. Sure they were churning it out on a deadline, but they were also dedicated to their craft. And I'm just not sure how true that is at the Big Two today. Okay, that's enough for one post! Thanks for sticking with me, Readers Mine! I know this is a bit off my usual beaten path, but I just had to share it with you. 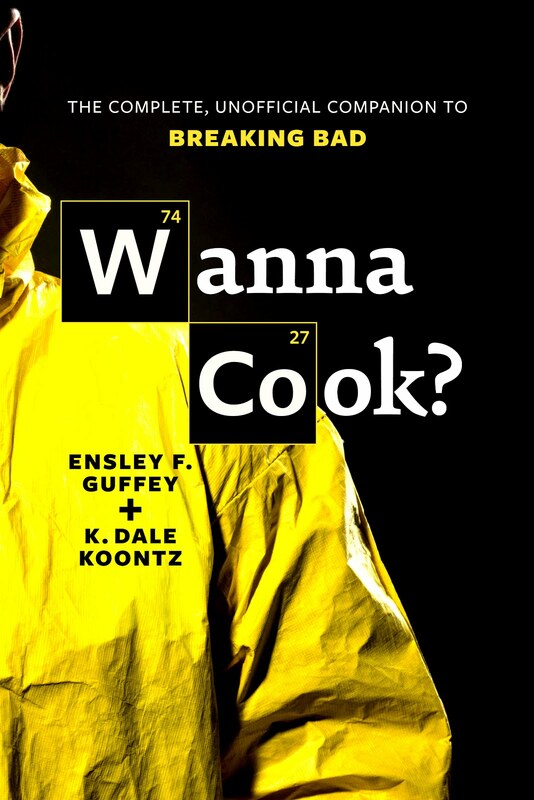 Come back around on Monday for the next installment of "Meth Monday" where I'll continue to ruminate on Breaking Bad and plug the book I'm writing with K. Dale Koontz: Wanna Cook? The Unofficial Companion Guide to Breaking Bad (see how I did that?). Until then - be well! When the fifth season of Breaking Bad premiered on 15 July last year, I had the great good fortune to be attending the 5th Biennial Slayage Conference on the Whedonverses at the University of British Columbia in Vancouver. Even better, I was able to watch "Live Free or Die" in the company of both Dale, my co-author on Wanna Cook? The Unofficial Companion Guide to Breaking Bad, and our brilliantly fantastic editor at ECW Press, Jen. Needless to say, the three of us were wound tight and incredibly excited to get to watch it together, and we'd made a party of it by inviting several other people into the room to join us. The downside to all of this is that, between frenzied discussions about the episode between we three BrBa fanatics, and frantic explanations to the poor benighted souls with us who'd never watched the show before, I managed to miss a key bit of information which I finally saw this Saturday when I rewatched the episode for the book: how Brock was poisoned. The final shot of "Face Off" (4.13) revealing the significance of the plant Walt was so fixated on in "End Times" (4.12). Okay, so after Gus' computer has been destroyed (and further evidence unintentionally revealed in the process), and Walt is riding high on his new-found sense of control, he goes to visit Saul, to work out a few issues. During the meeting, Saul gives Walt a Ziplock bag containing a single cigarette, which he reveals is Jesse's missing ricin-cig. Along the way Saul notes that his bodyguard Huell had to handle it and risk killing everyone in the office, and he censures Walt because "...you never told me the kid would end up in the hospital!" Subsequently, as Walt backs Saul up against the wall to tell him that "We're done when I say we're done," I began to realize that it isn't so much killing Gus which has put the fear of Walt into ol' Saul, but Walt's willingness to risk a child's life to get what he wants. Back in "Hermanos" (4.08), we see Saul delivering money from Jesse to Andrea and Brock after they've moved into a new house in a nice neighborhood. Saul talks easily and freely to Brock about school and girls, and Brock seems perfectly comfortable with him. Further, Saul's cash deliveries are apparently a regular thing. So, in "End Times," Walt gets the idea to use the lily of the valley plant he has by his pool to make a poison which will threaten, but hopefully not kill, and has Saul to give it to Brock. Judging by their relationship in "Hermanos," Brock probably wouldn't hesitate to take candy from Saul, and Andrea wouldn't hesitate to let him. At the same time, Walt tells his criminal lawyer about Jesse's ricin cigarette. In the same episode, Jesse receives a sequence of progressively frantic calls from Saul to come to his office, and when he does, he is immediately searched by Huell, who switches out Jesse's pack of cigarettes with the ricin in it for one without. The Next morning, Brock gets sick. "...Every single part of the plant – the stems, the flowers, the berries, and the leaves – are extremely toxic. 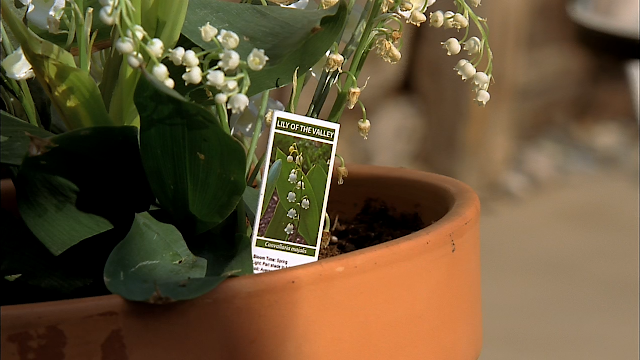 Ingesting lily of the valley can result in blurred vision, skin rashes, headaches, vomiting, disorientation and sudden alterations in heart rhythm. Treatment involves breathing support, IV fluids, and possibly the insertion of a temporary pacemaker to regulate your heart rhythms. And you could still die. And Walt knew all of that." Keep in mind that Walt was estimating a dosage amount that would make Brock seriously ill without killing him, all based upon only a couple of quick sights of the boy. In all likelihood Brock actually dying would have served Walt's purposes just as well, if not better than a serious illness. The whole point of the exercise was to manipulate Jesse into helping Walt kill Gus, after all. Brock was just a means to that end. Walt's darkness has now consumed his heart completely. That's it for this week's Meth Monday! Tune in next Monday for more ramblings on the best show on TV, and until then, you can get the latest BrBa news and notes by following me on the various social networks linked up there right below that creepy guy with the purple cephalopod on his noggin'. See you soon.